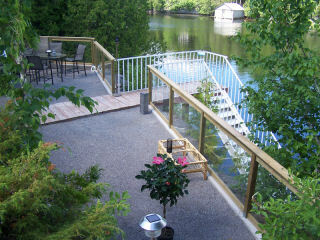 The spectacular view of the Trent Severn Waterway from the stairway and cliff will rejeuvenate you! 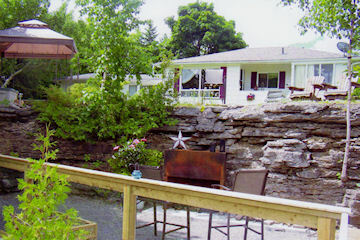 In beautiful Fenelon Falls, you will imagine you are in the heart of the Muskokas! 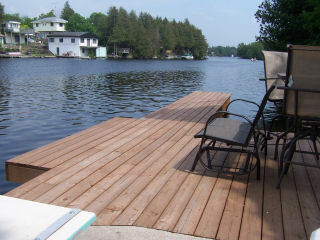 The waterfront is clean, with clear, deep water, perfect for swimming (there is a diving board! 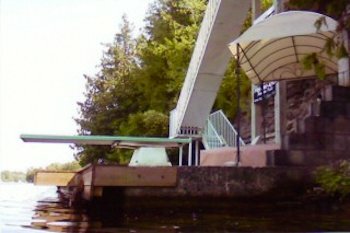 ), and mooring your boat at the large dock. 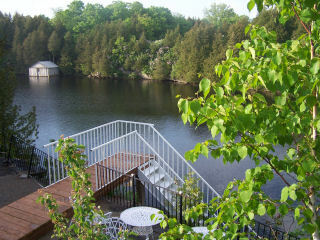 Fishing on this lake is excellent--prepare to catch lots of pickerel, bass, muskie and others. 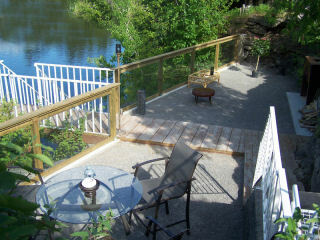 Relax on the patio or other levels of the property, and watch the parade of boats go by up the Trent Severn. The property is multi leveled, beautifully landscaped, with stairways and cliffs, with new glass railings, perfect for enjoying the view. 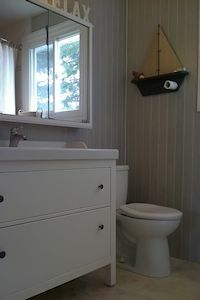 Would provide an excellent retreat for individuals, couples, fishermen and families with older children. 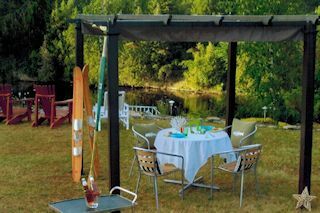 A fireplace is available outside for those memorable campfires by the lake-- bring your marshmallows! 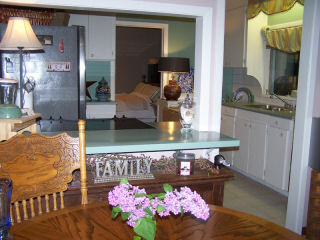 The inside of the cottage is nice open concept living space, so you can converse with your guests while cooking dinner, and entertain. The kitchen is fully equipped and ready for use. 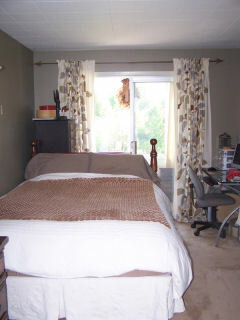 There are 3 bedrooms with the following sleeping arrangements... "The Master Bedroom": Queen sized bed. 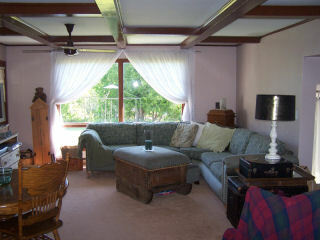 "The Sunroom" (off the Master bedroom): A single bed accomodation. The very large "Sunken Room": 2 single beds and a double bed, with a curtain available to provide privacy between the two sections. The "Guest" room: One single bed. Locally, five minutes away is a large grocery store. Other stores (LCBO, Beer Store, Laudromat, Gas, tourist shopping and many quaint restaurants) available in the town, a five minute walk away! 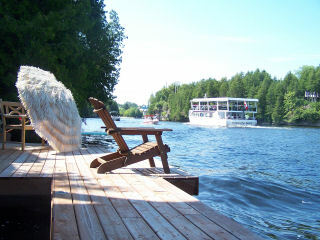 There are many local events and activities if you wish to partake, such as the "Kawartha Spirit Cruise Boat" that can take you on daily and evening dinner cruises. Local golf courses are nearby, as well as theatres, and of course casinorama is 50 minutes away. Maximun guests: 8 people overnight. 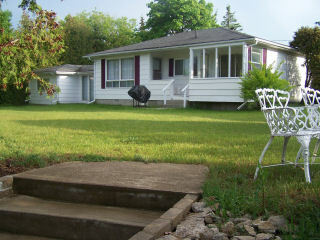 Please phone for inquiries & leave a message: 705-887-4765. September Spa Weekend with the Girls! 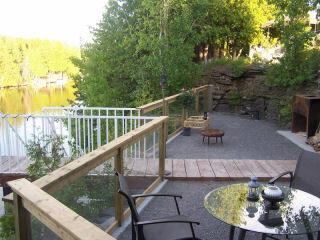 Includes 2 nights stay at the cottage "Muskoka in the Kawarthas". Spa package includes manicure and pedicure hosted by Stacie from Bodiworx. $150 per person for the whole package. Minimum 5 girls, maximum 8. Come and enjoy a spa weekend - ask about discount for 6 people or more! 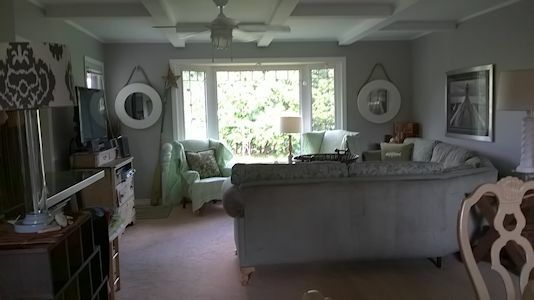 Sunroom at front with a covered porch, off master bedroom.